for the past 19 years. 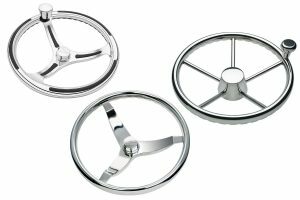 The American Boatbuilders Association (ABA) has named Schmitt & Ongaro Marine Products an exclusive supplier for stainless steel steering wheels, a position it has held since 1999. The contract is for three years and is a response to the company consistently providing the marine industry with exceptional products, service and support. The ABA is the leading buying group for independent boatbuilders in the US. Through its members’ collective buying power, it negotiates access to high-quality components and accessories at competitive prices. The organization also functions as an industry voice, representing its constituents with suppliers, governments and related industry associations. Founded in 1992, its website is www.ababoats.com. Schmitt & Ongaro Marine manufactures a wide range of innovative and superior quality marine components and accessories. The company offers some of the strongest product warranties in the industry. Contact Schmitt & Ongaro Marine Products, 1001 Ranck Mill Rd., Lancaster, PA 17602. 866-724-6488 (866-SCHMITT); Fax: 866-329-7679 (866-FAXSMSW). sales@schmittsteering.com. www.schmittongaromarine.com. This entry was posted in News & Press Releases and tagged Boat Accessories, Boat Wheels, Marine Steering Wheels, New Stainless Wheels, Schmitt & Ongaro Marine Products, Schmitt Steering Wheels, Stainless Steel Wheels on August 17, 2018 by Lesa Lewallen. Few components on a boat are touched as frequently as its steering wheel. That’s why Schmitt & Ongaro Marine designed Primus, its new cast stainless steel steering wheel, to deliver maximum ergonomic all-day comfort and engineered it for long-lasting, uncompromising durability. The visually striking wheel complements any helm and comes with a lifetime warranty. The Primus is manufactured using a unified investment casting, including the integrated ring, for massive strength. NMMA type-accepted and CE certified, it’s so strong, it greatly exceeds ABYC P-22 and ISO 8848 standards. Polished to a mirror-like finish, the 316L stainless steel provides superior corrosion resistance and has minimal maintenance needs. Satin-finish and powder-coated versions will be available in the future. Available in 13.5″ and 15.5″ diameters, the rim is slightly thicker than most other wheels. At 1–1/8″, the larger size lessens the hand fatigue that’s common with thinner styles. UV-resistant black Santoprene™ rubber provides all-weather control and comfort, and a dramatic counterpoint to the gleaming stainless steel. Underneath, finger grips deliver a sure, solid grip. It extends through the top of the rim, providing additional gripping surface. The contiguous piece of Santoprene also extends slightly under the spoke junction for a smooth, ergonomic fit. The result is an attractive wheel that matches any helm décor. The Primus is available in three spoke configurations: slotted with decorative Santoprene inserts, open slots or solid. Edges have a slight radius for comfort, without sacrificing its markedly defined appearance. The optional stainless steel Control Knob is large and comfortable. It’s installed on a spoke, 3/4″ from the rim edge, to ensure it won’t interfere with any controls or the driver’s helm space. The installation has no visible protruding fasteners to catch clothing or hinder the smooth tactile experience. Schmitt designed the knob with glass ball bearings to eliminate corrosion and provide a lifetime of free-spinning. The Primus incorporates the industry standard 3/4″ tapered hub. The durable stainless steel center nut works with all steering systems, with optional styles available. OEMs appreciate the wide range of available options. Custom Santoprene colors are available in quantity, and the knob and center nut can be engraved with a corporate logo or model designation. Ideal for center consoles, fly bridges, tower helms, RIBs and flats boats, the Primus is available for model year 2019, starting in May 2018. The 13.5″ model has an MSRP starting at $573.95 and the 15.5″, $633.95. Schmitt & Ongaro Marine manufactures superior quality steering wheels, horns, control arms and knobs, wipers and other high-quality components for recreational and commercial vessels. Known for its superior customer service, the company offers some of the strongest product warranties in the industry. This entry was posted in Uncategorized and tagged Anti-Rust, Boat Accessories, Boat Wheels, Marine Accessories, Marine Steering Wheels, New Products, New Stainless Wheels, Schmitt & Ongaro Marine Products, Schmitt Steering Wheels, Stainless Steel Marine Wheels, Stainless Steel Wheels on June 18, 2018 by Lesa Lewallen. Outpacing the marine industry’s overall growth trajectory, Schmitt & Ongaro Marine Products, manufacturer of steering wheels, horns, wipers and other high-quality components for recreational and commercial vessels, posted record sales figures for 2017. The company saw a 9.2% increase over the same period in 2016, with a three-year overall growth total of 37.8%. Several factors account for this exemplary growth. 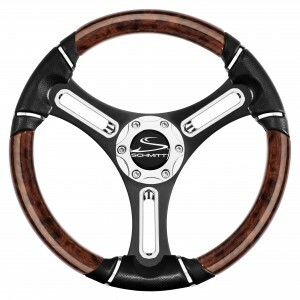 Schmitt & Ongaro continues to develop and market new, innovative marine steering wheels for aftermarket and OEM. The ability to provide boatbuilders semi-custom products has strengthened its customer base. Additionally, the company made purchasing easier for its European customers by accepting SEPA payments. Schmitt & Ongaro Marine manufactures a wide range of innovative and superior quality marine steering wheels, horns, wiper systems, control arms and knobs, and accessories. The company offers some of the strongest product warranties in the industry and exceptional customer service. This entry was posted in Uncategorized and tagged boat horns, Boat Wheels, corporate growth, electric horns, Marine Products, Marine Steering Wheels, marine wheels, motors, Polyurethane Steering Wheels, stainless steel steering wheels, wipers on February 22, 2018 by Lesa Lewallen. 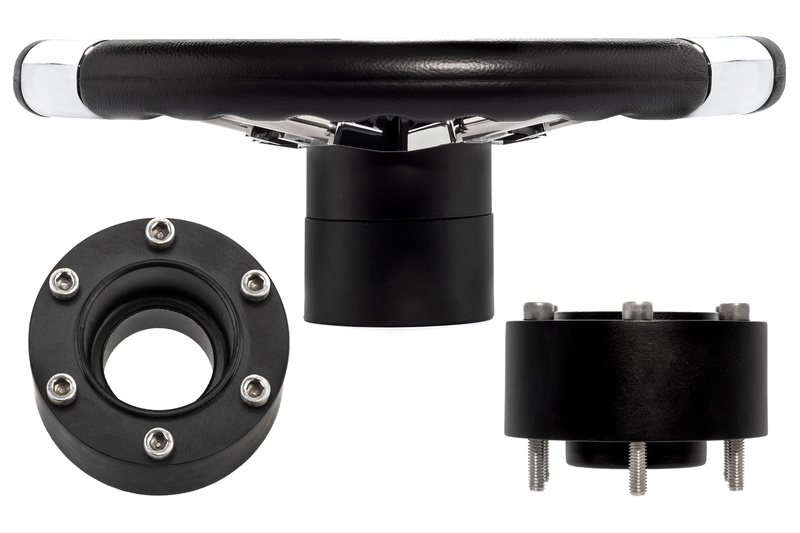 Whether to increase leg room, optimize a standing position or provide added clearance for improved dash access and visibility, Schmitt & Ongaro Marine’s Aluminum Hub Extension is the solution OEMs and boat owners need. 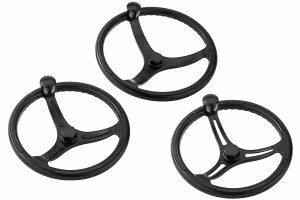 It works with any of the company’s polyurethane marine steering wheels, doubling the depth of the hub mounting space with an added 1.5″. The Aluminum Hub Extension is simple to install. The wheel is removed and the durable, marine grade, black powder-coated collar bolted onto its place. Then, the wheel is repositioned and reconnected to the extension. All hardware is included. Schmitt & Ongaro Marine’s Aluminum Hub Extension has an MSRP of $28.65. For over 60 years, Schmitt & Ongaro has manufactured superior quality marine parts and is renowned for its robust product warranties. Its lineup includes steering wheels, horns, wiper systems, control arms and knobs, and accessories. NOTE: This is an aluminum hub extension which must be utilized with an aluminum hub. This entry was posted in News & Press Releases and tagged boating accessories, boating parts, hub, hub extension, Marine Accessories, marine parts, Marine Steering Wheels, polyurethane wheels, wheel parts on December 12, 2017 by Lesa Lewallen. 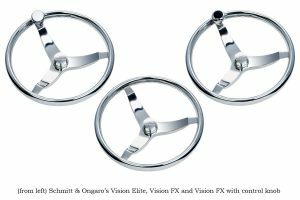 Quality craftsmanship and a feel of stability is immediately noticed when grasping a Schmitt & Ongaro Vision Elite or Vision FX marine steering wheel. Ideal for any boat, they’re attractive, yet incredibly strong and durable. At home on the primary or secondary helm of a fresh or saltwater boat, the Vision Elite and Vision FX are cast from 316 stainless steel for low maintenance. Highly polished, they feature a classic three-spoke design with finger grip rims for control in wet weather or when steering one-handed. Available in 13.5″ and 15.5″ diameters, they have a 22° dish for ample dash offset and install on an industry standard 3/4″ tapered shaft for maximum rigidity. The Vision Elite has an all-stainless steel knob mounted on a spoke for ergonomics and precision glass ball bearings for long-lived, smooth-spinning action. Likewise, the Vision FX is available with or without a stainless steel control knob with black cap and flange bearings. Both carry a lifetime anti-corrosion warranty. 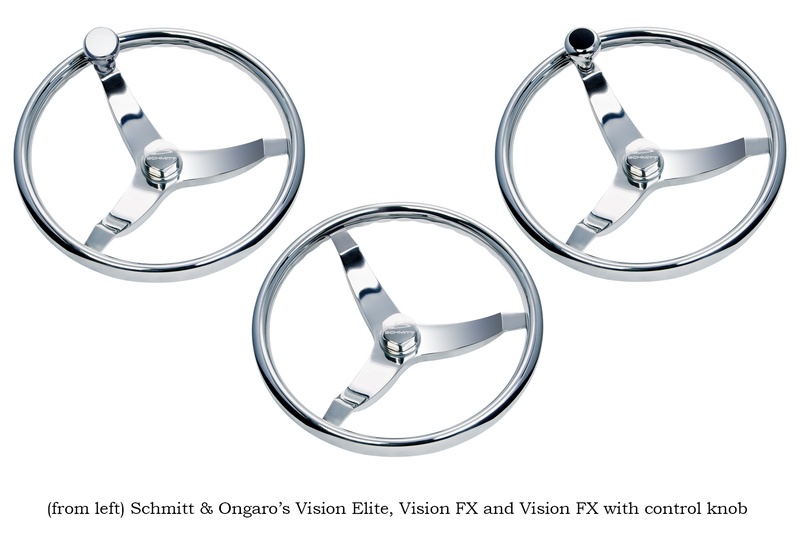 Perfect for OEM or refit, Schmitt & Ongaro’s Vision Elite wheels have MSRP starting prices of $240.40; Vision FX wheels without control knob, $174.80, and with, $218.50. This entry was posted in News & Press Releases and tagged glass ball bearings, lifeime anti-corrossion, lifetime, Marine Steering Wheels, OEM, refit, Schmitt & Ongaro, stainless steel, stainless steering wheels, Vision Elite, Vision FX, warranty on December 7, 2017 by Lesa Lewallen. Schmitt & Ongaro Marine introduces a high-quality aluminum and polyurethane marine steering wheel with a price point that’s competitive with all-plastic models. The exceptional yet economical Torcello Lite by Stella provides a sure, solid command of the helm and fits with any boat décor. The Torcello Lite is made to the same high, demanding standards for which the Stella brand is renowned. 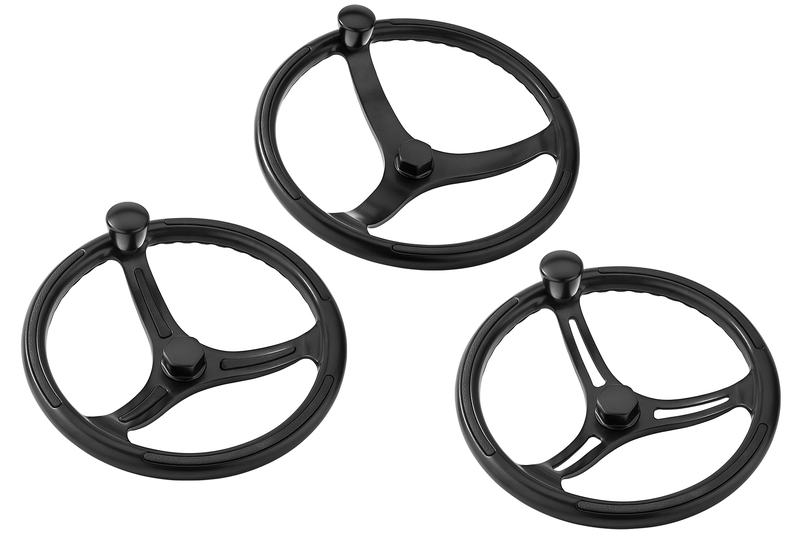 Boatbuilders can upgrade from a basic plastic marine steering wheel to this premium quality version, with minimal impact to the boat’s final cost. The 13″ Torcello Lite features three satin silver or black anodized aluminum spokes with stylish cut-outs. The ergonomic grip is cowhide leather-textured black polyurethane with accent areas having the look of perforated leather. Its black center cap can be upgraded to chromed ABS for an additional charge. It has a plastic hub with a 3/4″ tapered bore. Schmitt & Ongaro’s Torcello Lite has an MSRP of $89.95. Stella is a line of polyurethane steering wheels by Schmitt & Ongaro. Known for its superior customer service, the company is the industry’s foremost maker of innovative and exceptional quality marine accessories. Editor’s note: See the Torcello Lite and other fine Schmitt & Ongaro products at IBEX, October 4-6, Tampa, Florida, Booth 1813. This entry was posted in News & Press Releases and tagged Bass Boats, Boat Wheels, IBEX, Marine Dealer, Marine Distributor, Marine OEM, Marine Steering Wheels, Polyurethane Steering Wheels, Runabouts, Schmitt and Ongaro Marine Products, Torcello on September 28, 2016 by Lesa Lewallen. Making it even easier for European customers to access Schmitt & Ongaro Marine’s quality marine hardware, the company is now accepting SEPA (Single Euro Payments Area) for remittance. In 2013, it established a warehouse in Dronten, Netherlands, to expedite order fulfillment. SEPA is a payment integration initiative used to carry out cross-border financial transactions in Euros, regardless of the location within Europe. Easier, less expensive and more convenient than a bank wire, it’s especially helpful for those placing smaller orders. Payment and orders are received and processed in Schmitt & Ongaro Marine’s US office. The Netherlands warehouse fulfills the order, cutting down on lead time and delivery cost. Modern and efficient, the warehouse created a global standard for the company. Items that are not in stock, or custom-built by Schmitt & Ongaro Marine, are shipped from its US facility. 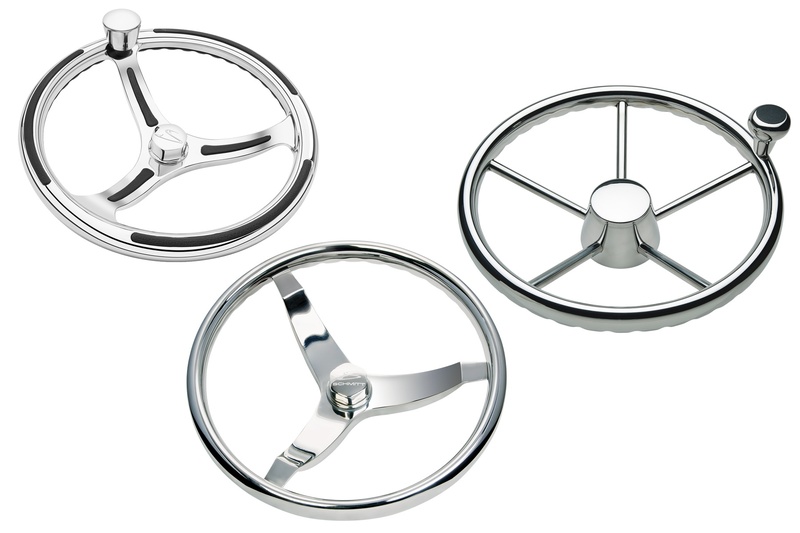 Schmitt & Ongaro Marine Products manufactures innovative and superior quality marine steering wheels, horns, wiper systems, control arms and knobs, and boat accessories. It offers exceptional customer service and some of the strongest product warranties in the industry. This entry was posted in News & Press Releases and tagged Euro, Europe, France, Global supplier, Netherlands, Schmitt and Ongaro, SEPA, UK on March 9, 2016 by Lesa Lewallen. Windshield wipers that sweep asynchronous can be annoying while keeping watch. Schmitt & Ongaro Marine provides mariners a distraction-free view of the seas ahead with its new Synchronized Wiper Controller. The unit simultaneously controls one to three motors for synchronized sweep at slow, fast or intermittent speeds. Users can select to wipe all the windscreens together or just the helm station. The provided rocker power switch also runs the wash system. If the controller is set at slow sweep, it will speed up the motors while washing. The innovative controller draws a maximum of 5A and is available in 12V or 24V. Both slow and fast speed settings have their own circuit for efficient operation and maximum torque. If a motor becomes overloaded, the power will break automatically. 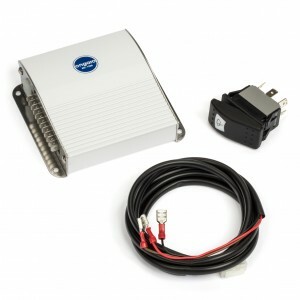 Like all products from Schmitt & Ongaro Marine, the Synchronized Wiper Controller is built to the highest standards to reliably perform in a marine environment. It comes with a three-year warranty and has an MSRP of $244.85. This entry was posted in News & Press Releases and tagged marine motors, Marine Wiper Motors, sychronized motors, sychronized wipers, wiper motors on January 14, 2016 by Lesa Lewallen. 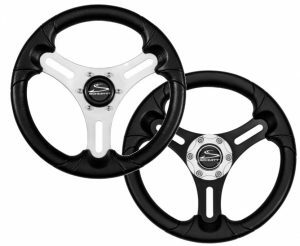 In response to the need for ever-more adaptability in customization, Schmitt & Ongaro Marine introduces its Torcello 05 series marine steering wheel. Based on its highly popular and successful 03 and 04 versions, the new model provides the boatbuilder or owner an even wider range of creative possibilities to match and enhance a boat’s décor. The most striking feature in the 05 series is the choice of rich burl wood- or carbon fiber-finished wheel sectors. Custom color and wood tone matching is available for OEM with a minimum order. Also new for the Torcello 05 series is the choice of silver, burl wood- or carbon fiber-finished trim sectors. Customers can select from black, brushed or polished spokes, and optional chromed inserts. Finishing off the choice of decoration is a chromed scallop or black plastic center cap. The Torcello 05 series features a grip that looks and feels like fine leather. Ergonomic finger grooves and spoke connection points add to the wheel’s luxurious, yet solid hand feel. The new polyurethane wheel features the same rugged construction that the Torcello name is known for. Measuring 14.2″ in diameter, the 05 series is the perfect size for a modern dash arrangement. It is available in 3/4″ tapered or optional splined hub. The Torcello 05 series offers customers the ability to build the ideal steering wheel and maintain control over its final cost. It’s the perfect choice for premium powerboats, pontoons, wakeboard and ski boats. The steering wheel has an MSRP starting at $225. This entry was posted in Uncategorized and tagged customized wheels, Marine Accessories, marine steering wheels; steering wheels, polyurethane, Schmitt and Ongaro Marine Products, wheels on December 18, 2015 by Lesa Lewallen.